Will my Facebook posts hurt me later on? Katie added a photo of her teacher from the school’s yearbook, and invited others to add their comments. Only three students posted their thoughts – all in favor of Ms. Phelps and critical of Katie. Two days later, Katie took the site down. Ms. Phelps never saw what Katie wrote, and she remained in her class for the rest of the semester. Two months later, the principal saw a copy of Katie’s writing and gave her a three-day suspension for cyberbullying and harassing a staff member. She was also dropped from her Advanced Placement classes for the alleged Facebook bullying incident. Katie did, however, graduate on schedule in June, 2008. In December, 2008, she filed a lawsuit against the principal for violating her free speech. She was asking for removal of the suspension from her permanent school record. Katie is concerned about job applications and graduate school/scholarship possibilities. Any future opportunities may be affected by the reference to her as a “cyberbully” in an official record. Check out this April 6, 2009 story in The Washington Post about campus police and their use of social networking sites to keep peace on school grounds. 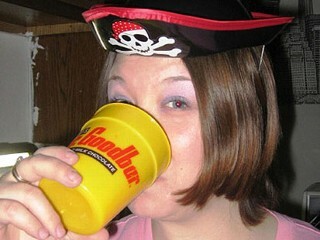 When Stacy was 25 she went to a Halloween party dressed as a pirate. She posted a picture of herself on MySpace holding a drink with the caption “Drunken Pirate.” Stacy was a student teacher at the time, but with less than outstanding performance evaluations. Just before graduation she was told that she would not be receiving her teaching certificate. One of the reasons was that her photo encouraged underage drinking which was inappropriate for a teacher. Instead she was given a degree in English but is unable to teach in Pennsylvania. Stacy sued the school but lost her case in December, 2008. Google yourself every now and then to see if there’s anything offensive or that might be taken wrong if seen by others. Have them removed before applying for a life-changing position or program. Update: In a recent case, a high school girls’ basketball coach in Idaho was fired for a picture that was posted on Facebook for less than 24 hours. In it, she is seen with her fiancé on vacation and they are both wearing swimsuits. He is touching her breast over her bikini top. Since the photo was posted to her account, she was fired while her fiancé, also a coach in the same district, was reprimanded and not fired. See real stories of teens who faced legal consequences for their online comments.